"Almond nails" are an on-trend nail silhouette that makes a serious style statement. They get their name from their shape as it's exactly like - you guessed it - an almond. Whether you use your natural claws or standout acrylics to achieve almond nails, there's no denying that they put a stamp of attitude on almost any outfit. 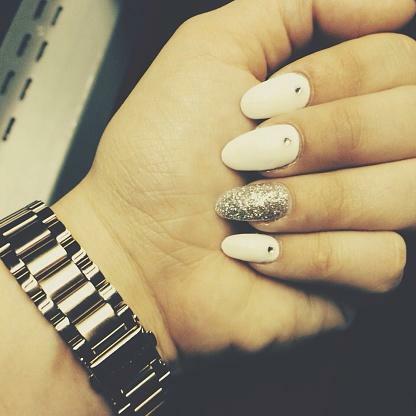 Almond nails are a fierce alternative to the traditional square or rounded tips. As well as elongating the fingers, they come to a rounded point and look elegant and feminine. The downside to almond nails is they're not always practical for daily tasks. They can also make it more difficult to grip an object or type on a computer keyboard or phone. The almond nail shape is easy to incorporate on long nails. All you need are a few basic tools. First, make sure that you grow your nails to the required length if you prefer the natural look. If you'd rather opt for acrylics but are struggling to find the right almond shape, stick a standard pair on your nails with square or rounded tips using nail glue and follow the rest of these steps. To start the shaping process, mark a spot in the center of your nail using a makeup pencil or pale felt tip pen. Then actively file each side at an angle towards a point that is just off center of the spot. The trick is to leave a flat tip so that you can round it out later. Once the angles are in place, round out the nail and seamlessly blend it into an almond shape. Finish the look off by using a buffer to polish your nail beds and leave a gorgeous natural sheen. It's entirely up to you whether you prefer the look and feel of natural or acrylic almond nails better. The benefits of having natural almond nails instead of acrylics is that acrylics have some health risks. For instance, you can catch them in a door, bang them against a hard surface, or have them ripped off your nail bed. This can be painful, as well as cause damage to your natural nails. 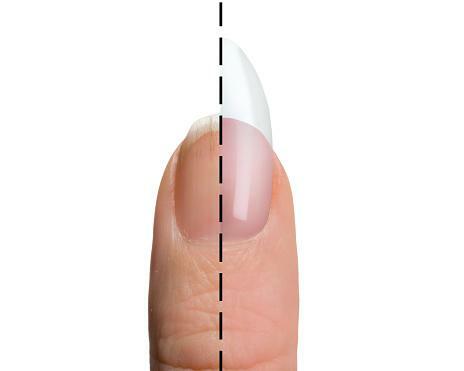 However, acrylics add length and thickness to your real nails to make them stand out more for all the right reasons. This is particularly useful when you want to showcase a special design through your almond-shaped nails. Even though acrylics tend to attract more attention, they are more challenging to maintain. You can't peel them off yourself as you might also pull off a layer of your natural nail by accident. They have to be removed if you want to take them off, or filled in, if you want to keep them on for longer, by a nail professional; whereas, you can easily take care of your real nails in your own time. There are several trendy designs that work extremely well with almond-shaped nails; however, the following are currently some of the most popular. Preened and Polished - You can keep things simple by implementing one all-over color to each nail, and your claws will still look incredibly fabulous. Fourth Finger Differentiation - A common trend is to have your fourth finger nail in a different hue or design compared to the others. It creates a beautiful and brilliant contrast. 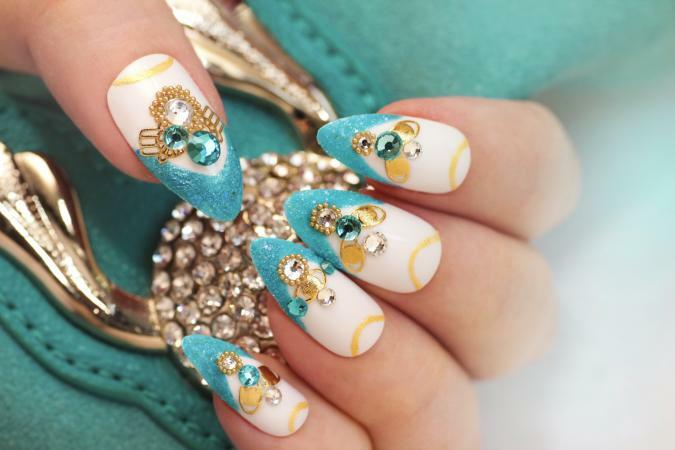 Glitz and Glamor - Your nails can receive an instant style update in the form of stick-on gems or embellishments. It's your choice whether you want to accent one nail or go for full-on glam by making every nail sparkle. 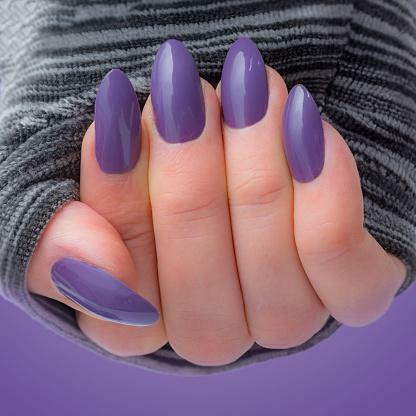 Quirky Tips - Some ladies prefer plain French tips that will go with every outfit and occasion; however, you can add distinction to one or more nails by incorporating quirky tips in a funky hue or design, like the marble effect. Kitsch Prints - If you're looking to amp up the sass, you can opt for a unique kitsch print that is both fun and adorable. Polka dots, stripes, and geometrics are some of the most popular. If you're tired of wearing the usual nail shapes, then it might be time that you give the almond silhouette a try. One-of-a-kind and lady-like, you can easily implement them using your natural nails or acrylics for added length and thickness. Then decorate them however you please. Experiment and take the time to figure out what works for you because one thing's for sure: almond-shaped nails show no signs of going out of style.